THINGS YOU WON’T FIND IN THE HANDBOOK. Fit/remove5mm hexagon key – much easier as two-person job with a key each. Simply loosen both bolts under the sliding cover at each end end of the bars. Then flip up the end-covers of the roof channels, slide the bar along, keeping it square to the channels, to the end and lift out. Do up the bolts finger tight for storage. It’s a good idea to give the threads a squirt of WD-40 to prevent corrosion. Tip: Ring round the established local Motor Factors (Yellow Pages)for prices and availability of pads (F&R); oil, air and fuel filters; 5L can of quality diesel engine oil. They will be much cheaper than high street shops but only open to 12 on Saturdays. Engine Oil15W/40 API CD/CE – 4.5L approx for oil change. For decades, vehicle manufacturers have been under pressure from fleet operators to extend service intervals. In the mid to late 1990s, most were arbitrarily extended to 12,000 miles (1 year) and in many cases the first service at 500/1,000 miles was dropped. Under this regime, vehicles would (mostly) survive the warranty period/mileage while inconveniencing business users as little as possible. Personally, when I used to do around 25,000 miles a year, losing the use of the car for a couple of extra half-days per year for intermediate (6,000 mile) services, was never a problem. If long-term cost and reliability is your priority, regular and more frequent servicing is essential, particularly for private owners clocking up the miles on short journeys (say less than 10 miles) and urban driving is particularly hard on the engine oil. 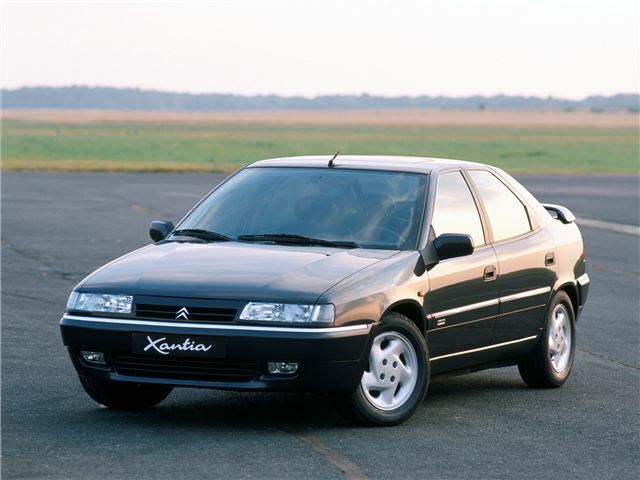 The handbook for my 95MY Xantia states 6,000 miles or 1 year intervals, but less than 6,000 miles a year implies lots of short journeys i.e. “arduous operating conditions” – for which a shorter interval (unspecified) is recommended. An oil-and-filter change every six months costs little more and will help the car last much longer. Since I stopped being a high-mileage driver, I do mine in spring and autumn with a thorough wash off underneath to remove the winter salt in April/May. The intermediate (6,000 mile or 6 month) service is an easy 1 hr DIY job: change engine oil & filter and bleed fuel filter. Filter and 5 litres of oil should cost less than £10 from your local motor factors –check the filter is a reputable make like FRAM. You should check all fluid levels every week or two and not rely on the low-level warning lamps – they mean stop and top-up NOW! Hydraulics. LHM (Liquide Hydraulique Minerale) is the life-blood of Xantias; essential for brakes, suspension and steering. NEVER ever use ordinary hydraulic fluid – it will ‘melt’ the seals and wreck the entire system! If the LHM level is much below (but still way above warning light level) minimum, brakes and steering become heavier (and the ABS may play up); the suspension level drops, the ride becomes harsher and the suspension can be damaged. Check the LHM level every time you check oil and coolant. You can only do so with the engine running and the suspension on its highest setting (control lever right back). The suspension needs to be ‘exercised’ like this once a week anyway to prolong its life. Let the car rise fully before checking the indicator on top of the hydraulic reservoir - the little orange float must be between the two lines; top up (slowly) with LHM until the float rises to the top mark. The LHM should be changed at every 72,000 mile service, but unless the system is completely leak-free you’re probably adding a complete change-worth every couple of years. It’s common for older Xantias to leak LHM – usually from the pump; when the pump’s thirst for LHM gets too bad, you’ll have to buy a reconditioned pump. There are several variants (even on the same engine type) so make sure you replace the pump with the same type. A different but compatible pump is likely to also mean changing pulley, mounting bracket and pipes. Anti-freeze These PSA engines are very sensitive to coolant quality. Change and flush every two years, fill (and top-up) with the correct 50/50 mix of anti-freeze and distilled (or rain) water. Tap water, which contains corrosion-causing impurities including chlorine, should never be used. Citroen thoughtfully provide a drain tap in the bottom of the radiator onto which a length of plastic pipe can be fitted to drain straight into a suitable (10L+) container. The cooling system capacity is 9L, but when re-filling, you will find that it will only take 6-7 litres. Start and run the engine for a few minutes. Switch off and top up the header tank. Take the car for a short test drive (couple of miles) to get it up to temperature. Switch off, carefully let any air out of the bleed valve and top-up again. Finally wash off any spilt coolant. Check the coolant level daily (when the car is used) over the next few days. If the engine subsequently uses any coolant, you have a problem – ignore it and it will become expensive. Check for radiator, heater and hose leaks. If a leak occurs at a hose clip, replace the hose; it has perished and will soon leak again if not burst. Check all the other hoses, replace any that look at all perished or oil-contaminated. Replacing all the hoses is cheap compared with repairing/replacing an over-heated engine. I’ve never seen a replacement interval suggested, but after a number of years (it seems to be more a matter of time than miles), thermostats get ‘tired’; while they still start to open at the specified temperature, they don’t open fully. Eventually, they get to the point where they open so little that not enough coolant passes through to stop the engine over-heating when it’s working relatively hard for some time (e.g. a motorway journey). Then engine boils, inevitably causing head gasket failure which may not be immediately apparent. As this caused the demise of our previous car, I checked the Xantia soon after buying it. The thermostat housing screws had never been disturbed in ten years so I bought a new thermostat. While I was at it, I compared the two in boiling water - the old thermostat only opened to about 1/3 that of the new one. Given the modest cost (under £20) and ease of changing most thermostats, I shall in future take the precaution of replacing the thermostat on any car at every third (6 year) coolant change. 7mm (1/4” drive) socket for the hose clip screws instead of chewing them up with a screwdriver. 11 & 12mm for various small set screws. 16mm –ring+open-end (handbrake cable) and deep socket are required (engine mounting bracket). T20 – tailgate trim panel, widely used elsewhere on trim. The Xantia’s hydro-pneumatic suspension makes jacking a doddle: Make sure handbrake is firmly on (don’t forget it works on the FRONT wheels) and that when the suspension sinks, the car isn’t going to ground on anything. Un-tighten wheel bolts on wheel to be removed. With engine running, move suspension lever to rear-most (Service High) position. Wait for car to rise fully. Place jack under the appropriate jacking point – there’s no need to do more than wind it up into contact. If you need to take off both wheels on one side, put the jack under the forward jacking point. With engine still running, move suspension lever to forward-most position (Service Low) and watch as first the unsupported side of the car sinks and then on the jacked side, the suspension lifts the wheels! Water ingress is ‘well-known problem’ in the back of Xantia estates. Often the first sign is wet carpets under the rear seats or in the rear footwell, by which time the foam backing of the load-space carpet will be very soggy (in places)! The underlying cause is usually said to be water leaking past the rear wiper spindle; in our experience, leaks around the tailgate light units are also likely culprits. However on all except early (LHD) estates, Citroen addressed the problem with a moulded nylon water shield stuck to the inside of the tailgate with sealant and rubber seals on everything passing through it or the inner tailgate moulding. The real cause of water leaks is always some ham-fisted Harry who disturbs the shield (to get at the rear wiper motor or the tailgate lock) and fails to put it back with sufficient care, or splits it (as with mine). The solution is obvious and dead simple, re-fit the shield properly. This is DIY job requiring no great knowledge or skill, just time and meticulous care. The only tools needed are T20 and T30 Torx (star) bits, plus a can of white grease and a tube of silicone sealer or automotive mastic. Your local automotive factor will stock all these at a fraction of high street prices. While you can get behind the shield, take the opportunity to lubricate the lock mechanism with white grease - don’t use anything else. When re-fitting the shield, remember that the shield must be completely watertight – when the tailgate is lifted, any water inside will run from bottom to top, and then back again as the tailgate is closed. Completely remove all the old sealant along the bottom and several inches up the side; also remove any sealant elsewhere that’s reluctant to restick. Carefully repair any splits with automotive sealing tape or duct tape making sure there are no gaps where water can run out even when the tailgate is up. Reseal the shield to the tailgate moulding with mastic or silicone sealer – better messy than leaking, no-one will see. Of course if the shield is missing, you’re going to have to try and get a reasonably sound one somewhere. Remove all three tailgate light units in turn. Wipe clean the rubber seals and the mating surfaces of the tailgate with a wet rag. Polish the painted surfaces with body wag – it makes it water repellent - but be tempted to wax the seals (the wax may attack the rubber). Refit each light unit, being careful to tighten the fastners evenly – don’t over-tighten! At the risk of stating the obvious; make sure you dry out the carpets and footwells thoroughly and then keep a careful eye on them until you can be sure the leak really is fixed. Our Xantias live outside parked on a slope – always nose up, then the slightest leak is obvious when the tailgate is lifted. The 1.9 diesel (XUD & XUTD) engines are classified as Class 5 interference – if the belt breaks or jumps several teeth, the resulting collision of pistons and valves will cause major internal damage (£400-£1000); a replacement engine is likely to be the cheapest if not only option. For this reason, it’s vital to get the timing right first time when changing the timing belt. Although Citroen recommend a 76,000 mile interval, accepted wisdom is that the cambelt should be changed at roughly 50,000 miles intervals - say every 48k or 4 years whichever occurs first. The 2.8 hours quoted in the handbook for changing the timing belt must be for a Citroen mechanic who does it every day in a fully-equipped workshop - reckon on at least a day. The Haynes manual is a great help, but does omit some vital details which I hope I’ve covered here. While the ‘front’ of the engine is exposed and all the belts are off, inspect the crankshaft and camshaft oil seals and the water pump for leaks. If any of them show any signs of leaking, change them at the same time. Water pump weeping idicates imminent failure and oil contamination will shorten belt life. My friendly local mechanic (who works on these engines in vans) reckons that it's essential to remove both tensioner and idler for inspection. Given the labour involved in changing the belt, for the extra £50 or so, fit a tensioner kit rather than run the risk of having to do the next belt change early when either the tensioner or idler starts to fail. Complete failure equals wrecked engine! On my Xantia at 68,000 miles, slack in the idler bearing was just detectable and it was starting to leak grease slightly - it wasn’t going to last 50,000 miles or 4 years to the next scheduled belt change. In any case, replace them both at every other belt change – every 96k. The crankshaft bolts are known to come undone and to break, so always use a new one (£2.50) when refitting the crankshaft pulley. The bolt is not normally included in a belt kit (belt, tensioner and idler). 21mm ring spanner for the injection pump nut (to carefully and slowly rotate the engine to alignment). 22mm socket (1/2" drive) and a BIG (450mm+) breaker bar are essential for the crankshaft bolt. A 'mirror on a stick' is a big help. 10mm square drive (tensioner) - buy a cheap 3/8" socket set (mine cost £5.95). 3/8" is 9.5mm (near enough to the 10mm square hole in the tensioner arm). I found that a Molegrip clamped on a short (70mm) 3/8" extension was the only thing that would fit between camshaft sprocket and inner wing. The nut spinner, rachet and small sockets in the kit saved much time and effort. To make a proper adjusting tool, the key dimensions are: face of the adjuster to a) the outer face of the camshaft sprocket (35mm) to b) the face of the inner wheel-arch (60mm) and adjuster thickness (5mm) – all approx. Trolley jack: You can’t support the engine with a hoist as the lifting bracket has to be removed to get at the tensioner spring. Support the right-hand end of the engine engine on a trolley jack with a short length of timber (100mm x 50mm minimum) bridging the sump and the rear engine mounting. This allows you to slightly raise and lower the right-hand end of the engine to marginally improve access to various things. Over-night the jack will probably sink slowly - temporarily refit the engine mount. Timing bolts: the ideal timing alignment bolts are: 1 off M8 x 50mm for the cam shaft (cap head is easiest to fit) and 2 off M8 x 45mm (ordinary hex head) for the injection pump. Typex or similar to paint alignment marks on the crankshaft timing pulley and the crankcase (see below) when the alignment bolts are in and before the belt or tensioner are disturbed. Remember that the timing is either spot-on or at least one whole tooth adrift. Some means of blowing out the thread in crankshaft - Lilo pump is ideal. If the belt has ever been changed, the paint seal on the nut (and stud) that secures both upper and front belt covers will be broken. On my (96) engine the turbo pipes make removal of the upper belt cover a nightmare. To make matters worse, the turbo pipes can't be removed as the screws of the jubillee clips on the turbo are inaccessible. But, by removing the air pipe from intercooler to inlet manifold (and hence undoing the mounting screws for the pipes to and from the turbo) and also releasing the rigid pipe from the aircleaner rubber elbow, the turbo pipes can be waggled enough to let you undo the rear securing setscrew of the upper belt cover and to fiddle the cover off with the judicious application of a little force. All bar one of the belt cover set screws are fairly obvious - the bugger is one at the back of the upper cover, it's invisible without a mirror and one of the cooling system pipes sits on top of it - push the pipe out of its clips to get at the (11mm) setscrew. The crankshaft bolt will be very tight - an impact air-wrench at its maximum setting (160ft/lb) wouldn't budge mine. In the end, the only solution was to fit a socket with a big breaker bar supported on a block of wood. Fingers crossed and a quick flick of the starter did the trick. This is potentially dangerous and definitely only recommended as a last resort; the bolt could shear and/or sent the tools flying - but having exhausted all conventional means..(Jim reckons that apart from shearing the bolt there's no risk of damaging the starter or engine doing this) - the bolts are known to shear anyway. As the bolts are known to come loose in service, the factory use Locktite on both faces of the thick washer under the bolt head. Do the same when refitting! Before removing the cambelt, rotate the engine clockwise slowly by means of the the injection pump pulley nut until the pump and camshaft pulley are aligned with their timing holes. Over-rotate a fraction and then rotate back to tension the belt correctly (the crankshaft normally drives pump and camshaft). Now paint an alignment mark with Typex on both crankshaft timing pulley (in line with the key is best) and the engine block. The tensioner pinch bolt is below and behind the camshaft pulley - it can just be seen by looking between the pulley and the camshaft housing. You should remove tensioner and idler to inspect them. When re-fitting the tensioner, the spring and plunger in the engine mounting bracket (that provide automatic tensioning) is a sod to re-fit. The trick is to fit the tensioner assembly first (without the belt), lightly locked off in its most clockwise position. The mounting bracket fits on a pin - make sure this is free of rust and lightly lubricated so that the bracket slides smoothly on it. The plunger and spring WILL fall on the floor several times - spread a large clean rag or dustsheet on the floor to save having to keep cleaning them. With the bracket partly fitted, push the plunger upwards from below with a hammer handle or similar while gently levering the bracket sideways into position with a piece of softwood about an inch thick. Haynes suggest making a tool but give no dimensions; in the time it would take to find the raw materials and make the tool, you can refit the tensioner the hard way three times over! Follow Haynes instruction for fitting the new belt with the following provisos: To tension the timing belt, you'll have to re-fit the crankshaft auxiliary belt pulley and use the crankshaft bolt-head to turn the engine over at least two crankshaft revolutions (SLOWLY and GENTLY). Use the OLD bolt for this, having first cleaned its threads thoroughly with a wirebrush; DON'T use WD40 or any other fluid, as it's vital not to contaminate the crankshaft thread. When removing the old bolt (and auxiliary pulley) to see the timing mark, first remove timing bolts, engage 5th gear and pull the handbrake on hard to lock the engine. Use the previous trick of very slightly over-rotating and going back to the timing marks to re-tension the belt before checking alignment. Before finally fitting the new bolt, blow out the crankshaft threads (see Tools). When fitting the new bolt, use thread lock on both faces of the washer under the bolt-head. You need to fit and tighten the bolt as specified without wasting time before the thread lock sets – you really need someone to stand on the brakes as well as locking the engine in 5th. You will need: Wheel-brace, large screwdriver, long-nosed pliers, hammer, pin punches, 8” file. If you don’t have access to a vehicle lift, you’ll have to do one side at a time. Securely chock rear wheel on one side, release handbrake and jack up opposite side (see Jacking section). Remove wheel. The calipers swing up on the guide pin, be careful not to kink the handbrake cable. - Drive out the retaining pin with a proper pin punch of the right size – they vary from being very tight to needing no more than a couple of taps and a push. - Screw the piston back into the caliper - either with a special tool or by using something like a file across the slots – until the base of the slots are flush with the face of the caliper. The piston should turn fairly easily but will be more than finger tight. - Pull caliper forwards and swing down making sure that the ‘pimple’ on the inner pad sits in the middle of a slot in the piston face. - Reverse the first 4 steps above – note that the outer sensor wire must go under the clip by the retaining pin and be twisted once around the upper wire to stop it waving around. 24-7-2016: If the alternator belt comes off the XUD 1.9TD engine in a Xantia it can wrap itself around the bottom of the timing belt, taking the timing belt off its pulley and allowing the engine tyo self-destruct. Do not use cheap pattern alternator belts.